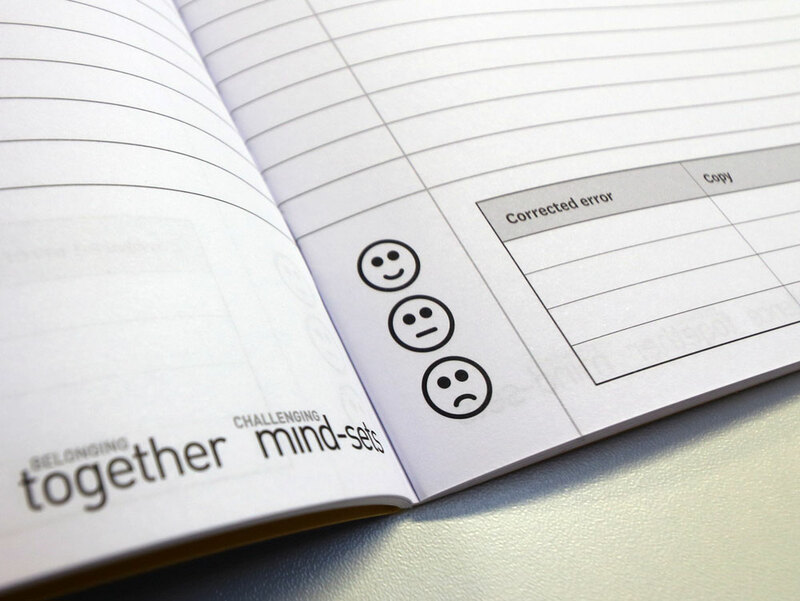 Our bespoke exercise books really can help your students to produce better work. Not to mention saving teachers time. Our exercise book design service will ensure that your books are crammed full of features that help your students learn and give your teachers tools to work smarter. See your students’ pride in their work improve overnight as they respond to books that look and feel so good. "The bespoke exercise books have to be seen to be believed and used to be truly valued as a vehicle for raising standards..."
*Excludes reprint orders. Orders must be in multiples of 50. Our exercise books are all oversized and come with 80 pages as standard. Plus, with square-back binding and four-staple stitching they are designed to withstand the rigours of school and will last longer than your average book. 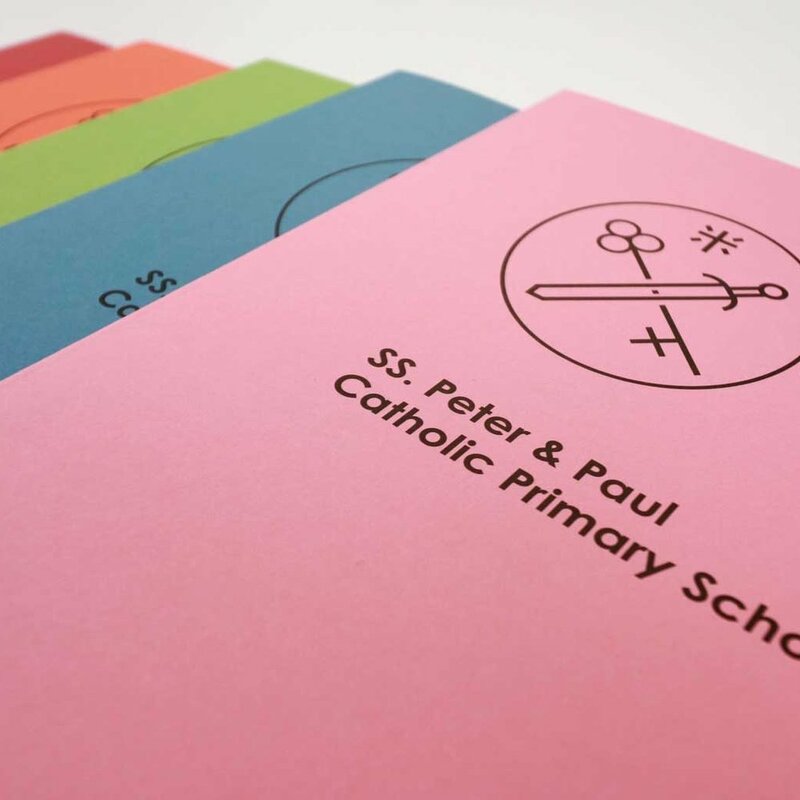 All of our branded exercise books are supplied in an oversized A4 format, meaning less wasted time trimming down insert sheets for you teachers and students. Plus, we can help you design a book that helps you save time marking. Our books are all printed in the UK using high-quality, FSC approved paper, which means you can rest assured that for every tree that gets cut down making your books, it has come from a sustainably managed forest. Thank you! Your sample should arrive within 3-5 days. The Media Collective and Lion FPG are working together to bring to market a school exercise book which is truly class-leading. By bringing together our best skills, we can create your next exercise books to help deliver a wide ranging impact within your school, at a price you can afford. Every book we make benefits from our combined attention to detail and specialist knowledge. I need a few books quickly. Can you do this? All of our books are printed to order and we don’t hold stock of the cover material so even a handful of books can sometimes take 2-3 weeks. If you think you might run out it will always pay to add a few extra to your main order as you will get the best possible price. Do you make other sizes of books? At the moment all our books are oversized A4 as standard. Can you print in full colour? All of our bespoke exercise books are printed in black only. We’re trying to give schools the best quality of book possible at a reasonable price and this helps us do that. Why are reprints more expensive than the books I bought first time? Your books are printed to order every time (we’re not buying a bunch of cheap books from China and adding your logo to the front). We can offer better unit prices for larger print runs. If you think you might run out it will always pay to add a few extra to your main order as you will get the best possible price. I need some books that are dyslexia friendly, can you help? Yes, we can print inner covers on coloured paper at a small extra cost. Talk to us if you need this.